The NASCAR Xfinity Series completed the 2018 edition of its four-race Dash 4 Cash program Saturday at Dover (Del.) International Speedway with the running of the One Main Financial 200, won by Justin Allgaier. 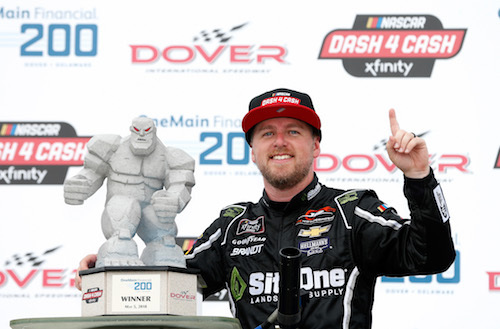 The Dover race was an exciting one, especially at the finish, with JR Motorsports teammates Allgaier and Elliott Sadler battling door-to-door for the win. The four races at Bristol (Ten.) Motor Speedway, Richmond (Va.) Raceway, Talladega (Ala.) Superspeedway and Dover that made up the D4C program provided, in general, exciting racing, and they did so without the presence of Monster Energy NASCAR Cup Series stars like Kyle Busch, Brad Keselowski, Kyle Larson, Kevin Harvick and the like. That fact, I’m sure, was to the delight of the proponents of getting Cup Series drivers completely out of the Xfinity and Camping World Truck Series. After all, no Cup drivers — ahem, Busch — were there to take the lead, pull away, stink up the field and take the win. Still, I’m not on that “get Cup out of Xfinity” bandwagon, and I don’t think I ever will be. Sure, the last four races have been edge-of-your seat spellbinding, with the aforementioned JR Motorsports battle for the win at Dover and the surprising win by never-led-a-lap-before Spencer Gallagher the weekend earlier at Talladega. Would I like to see races like that every weekend? Sure, but I don’t want to risk killing the series in an attempt gone wrong to get it, and then, fail. Cup drivers always have been a fixture in the series now known as the Xfinity Series. Busch didn’t start this trend. Heck, neither did Harvick when he raced both series full-time upon the death of Dale Earnhardt in the 2001 Daytona 500. And speaking of Earnhardt, he dipped his foot into the Xfinity (then-Busch) Series waters in the early days of the series. I actually believe team owners who are saying that they need to be able to put Cup drivers in their Xfinity Series cars, at least part of the time, to get sufficient funding to keep teams going. Not as many Cup drivers run in the Truck Series, and a few teams in that series — good, championship-contending teams — have shut their doors in the last couple of seasons. Are the two related? Maybe, maybe not. I’m not sure sure I want to take the risk that they’re not related, at least not enough to risk the life of the Xfinity Series, to find out. I hear critics of Cup drivers in Xfinity complain that these Cuppers are taking seats away that could be going to up-and-comers. Really?!? If those teams go away, because they can’t find enough sponsorship to make a campaign worthwhile, what teams will these up-and-comers drive for, then? Disgruntled fans have been complaining this year about Cup race fields with fewer than 40 cars. Wonder how much those same folks would enjoy an Xfinity Series race with, say, a dozen or so cars. I’m guessing they wouldn’t. Then, there are the folks who use faulty comparisons with stick-and-ball sports, comparing college and pro ranks of basketball and football to the Xfinity Series and Cup Series, relating Xfinity to college and Cup to pro. Here’s why those comparisons are faulty. The Xfinity Series isn’t exactly a “lower” level of racing; it’s not a development level, either. I get that error of thinking, though. Many drivers over the years have used various racing series, including NASCAR series, as a ladder, of sorts, ultimately, to get to Cup. Heck, that misconception is so popular that NASCAR now bases its Xfinity Series marketing efforts on it. But that’s not why series like the Xfinity Series and Camping World Truck Series were created. They were created to give fans, yet, another series to follow during times of growth. Besides, where would this college/pro analogy leave guys like the aforementioned Sadler and Allgaier, and former multi-time champions in the Truck Series, Ron Hornaday and Todd Bodine, for that matter. Sadler and Allgaier both spent time at the Cup level before successful returns to Xfinity for career rejuvenations, of sorts. Pros don’t return to playing college ball; they may return to college, but not to play ball at that level again. If Xfinity is college and Cup is pro and NASCAR operated the same way as the sick-and-ballers, Sadler and Allgaier wouldn’t have been in that race at Dover Saturday. What about four-time Truck Series champion Hornaday? If he hadn’t been allowed to return to the Truck Series after a failed Cup Series career, he’d be a two-time champ, not four. Here’s a more recent example: Johnny Sauter. Maybe those making the college/pro analogy don’t realize that, prior to winning the Truck Series title in 2016, he made a lackluster attempt at full-time Cup Series racing in 2007. When you think about it, the Xfinity and Truck series don’t seem so much like developmental series anymore, do they? When rules limiting Cup-drivers in the Xfinity and Truck series came about, I admit I was a critic of the limits for the reasons I’ve stated, here. I admit, though, I am coming around to those limits, and race finishes like we’ve seen in the Xfinity Series the last couple of weekends have helped me do so. But I think the current limits of allowing Cup drivers in a handful of Xfinity and Truck Series races per season are the way to go, not complete elimination. I think NASCAR has found a happy medium, and I’m happy with it. I like the exciting racing we’ve seen among the Xfinity Series regulars, but I don’t want to risk killing the series, completely, in an attempt to get that every week.